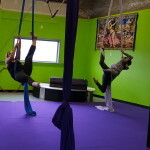 Aerial Yoga class is for people of all shapes and sizes. 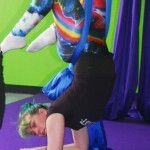 No matter if you are bendy and strong, or quite the opposite -you are welcome at The Last Carnival Aerial Yoga classes. We are here to help you meet your personal flexibility and strength goals, progressing at a rate that you are comfortable with. Listen to your body. Whether you need to lighten or deepen a stretch, the Aerial Yoga instructor can modify any of the poses to help you achieve this. Bring your yoga practice to new heights; bring it into the air. 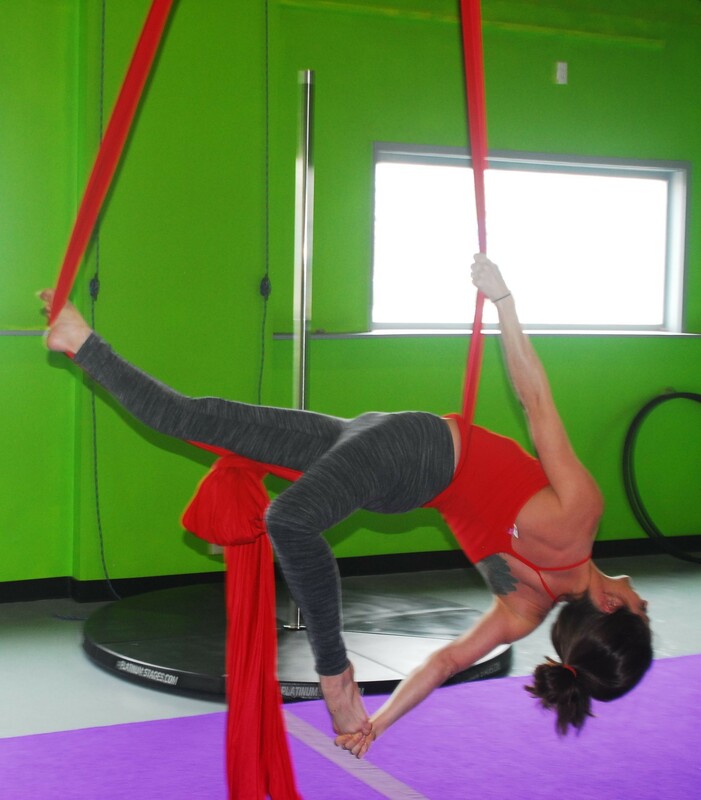 Aerial Yoga uses the aerial silks to support and on certain movements suspend you just a few feet from the ground to partially or fully support the weight of the body during different poses and stretches. Flight in your flexibility and fitness routine is designed to help you find your true potential and to help you achieve advanced yoga and contortion postures that may have been difficult to achieve using traditional methods and deepen stretches in ways that you may not be able to on your own. In contrast to regular yoga practice on the floor in which the body exhibits tension against the pull of gravity, Aerial Yoga releases body tension. Students are able to naturally achieve proper body positioning and alignment through the straightening of the spine and shoulders. The pull of gravity, when the body is in a hanging position, naturally decompresses the spine and the body. With Aerial Yoga you can increase flexibility and strengthen muscles without straining them. No prerequisite required. 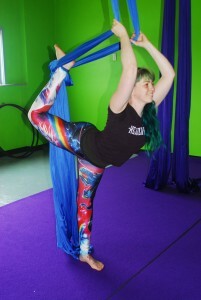 Sihka has designed this class by combining her studies of flexibility and strength, dance, aerial, and contortion to bring you the best possible aerial yoga experience. DROP INS WELCOME, but class spots will be given to those who pre-register online first (there will be four spots total available). $25/class (evening classes) $20 (daytime classes). When you sign up and prepay for the whole 6 week course the price per class is discounted to $20/class (evening classes) or $15/ class (daytime classes). Register online today though The Last Carnival calendar page. Want to schedule a time that works for you? Get a group of three or more friends together and we will make a class of it or schedule your own private lesson today! We now also offer a Level 2 Aerial Yoga class. For more information please talk with one of our aerial yoga instructors.